Summary: Learn how to install underfloor heating, install an underfloor heating cable system and fit a mesh mat underfloor heating system. * Notifiable project requiring Building Control approval. Underfloor heating has several advantages over other heating systems: it is quiet, does not need radiators fixed to the walls and distributes heat evenly across a room. On the other hand, it can be slow to heat up and cool down, and requires disruption to the flooring to install. Also the type of flooring can affect the performance of an underfloor heating system. 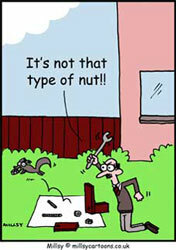 When choosing your supplier, aim for one that offers technical support. 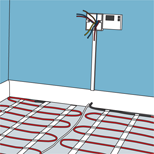 For DIY installation there are two electric systems available: heating cable and mesh mats. Both systems can only be laid under ceramic floor tiles. After the cable has been laid and a temperature probe installed, tile adhesive is spread over the cable and the floor tiles are laid. A thermostat positioned on the wall controls the system. If the total power consumption is less than 3kW, this can be wired as a fused spur on a ring main circuit. If the total power consumption is greater than 3kW then it will need its own separate circuit fitted with a 30 or 32 amp MCB at the consumer unit. 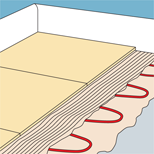 Mesh mat underfloor heating is the easier of the two systems to install. The cable is in parallel loops but woven into mesh mats. The mats will be 500mm (19 ½ in) wide but can vary in length from 1m to 20m (about 3ft to 65ft). When calculating the amount of mesh mat needed, the coverage is normally based on 90% of the floor area. Therefore a floor area of 10 sq metres will require 9 sq metres of mesh mat. A thermostat connector will be fitted to each end of the cable. In the centre of the room a temperature sensor is positioned and covered in flat oval conduit, which is connected to a wall-mounted thermostat controlling the heat output. 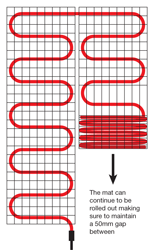 The type of floor you have also influences how you lay the mesh mat. A suspended timber floor needs to have cement thermal boards laid over it to direct the heat upwards, so laying the mesh mat on a concrete floor is easier and this is the method we look at here. Turn off the mains supply. Before commencing to lay the mesh mat, carry out an insulation test on the mat with a digital multimeter to check that it has not been damaged. Apply a probe to each of the cores and if the light illuminates on the multimeter then the circuit is complete and the mat undamaged. At this stage you should also plan the position of the FCU and the wall-mounted thermostat. 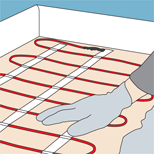 Make sure the thermostat connector at the end of the mat will be close to where the thermostat is to be positioned. Mark the position of the FCU and thermostat on the wall and prepare the cable route. The mesh mat has to be laid on a covering of flexible tile adhesive applied at about 5mm (¼ in) thick. Using a notched trowel spread the tile adhesive over an area of the floor just a little wider than the mesh mat. Unroll the mesh mat on top of the tile adhesive and press it in using your hands (wear gloves when doing this). Roll out the mesh mat until you reach the other side of the room. Cut the mesh matting so it can be turned and rolled out in the opposite direction. Do not cut the cable. 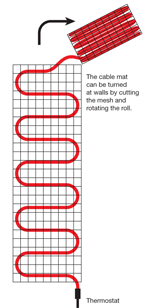 Apply more tile adhesive to the floor and unroll the mat towards the wall from where you originally started, maintaining a gap of 50mm between the edges of the mat. Press the mat into the tile adhesive as you go. A gap of at least 50mm should also be maintained between the cable and the walls and any fixed object. Continue laying the mat on top of tile adhesive in this fashion until you have reached the other side of the room. After the mat has been laid avoid walking over it unless necessary, as excessive traffic may damage the cable. At this stage carry out an insulation test on the mat with a digital multimeter to check that it has not been damaged. As before, apply a probe to each of the cores and if the light illuminates on the multimeter then the circuit is complete and the mat undamaged. Enclose the temperature sensor or probe in oval conduit and position it in the centre of the matting. Some manufacturers recommend taping over the end of the sensor to prevent absorption of tile adhesive. With the mesh mat laid the electrical connections can now be completed. Follow the instructions supplied by the manufacturer for connecting the FCU and thermostat to the mains supply. If the power output of the underfloor heating does not exceed 3kW it can be run from a fused spur on a ring-main circuit. Larger floor areas requiring a heat output greater than 3kW will need a separate circuit run from the consumer unit with a 30 amp or 32 amp MCB. With the connections made carry out a third insulation test on the mat with a digital multimeter to check that it remains undamaged. The floor tiles can now be laid. Cover the mesh mat with 5mm (2in) of tile adhesive and follow the instructions for laying tiles in the project Laying ceramic floor tiles. Wait two weeks before using the under floor heating to let the tile adhesive set and dry out thoroughly. Firstly, plan the position of the FCU and the wall-mounted thermostat. Cut the mesh matting so it can be turned and rolled out in the opposite direction. Leave a 50mm gap between the mats. Press the mat into the tile adhesive with a gloved hand. Cover the mesh mat with 5mm of tile adhesive and lay your ceramic floor tiles on top.